This nail art is a jump-off from my original Black Caviar Nails post that seemed to have gotten a lot of attention and praise. I received a few requests for more nail looks using rhinestones and a lot of you wanted to see more matte nail polish looks using color. 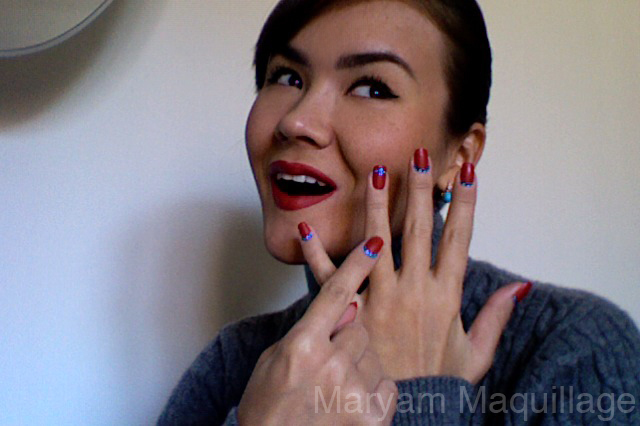 So, with those components in mind, I'm presenting the first of my two nail creations for Valentine's Day. A Matte Red so gorgeous, I almost didn't want to embellish it!! Verdict: This polish is über chic and so, so different from what you would normally expect from a classic red nail. The matte finish results in a beautiful, unusual manicure that gives this classic look a much needed edge. I love this product and will wear it with pride on its own and as a base for a funky female empowered nail art. POW!! After the base coat, I applied two coats of the Matte Red polish and waited for it to dry. 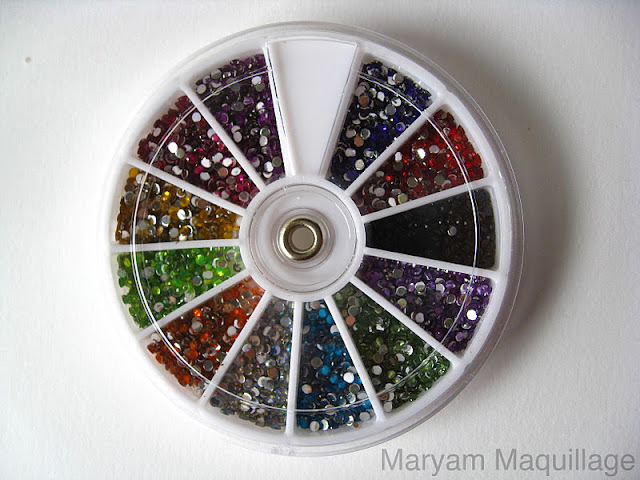 I prearranged the rhinestones to lie on their flat side and using a wet orange stick (toothpick or match works just as well) picked up each one and placed it on a thin strip of nail glue at the root of my nail. For my ring finger design, I drew a thin ring band using a gold nail art pen and attached the rhinestones to the center of the band to form a ring. I finished the design by securing a top coat over the stones only. Pretty! Love the shade of red. Easy to do, and bright gorgeous colors. Maryam, you truly inspire me!!! Love this color! These nails are gorgeous! GET IN LINE, NO CUTSIES! If you like you should put a ring on it! 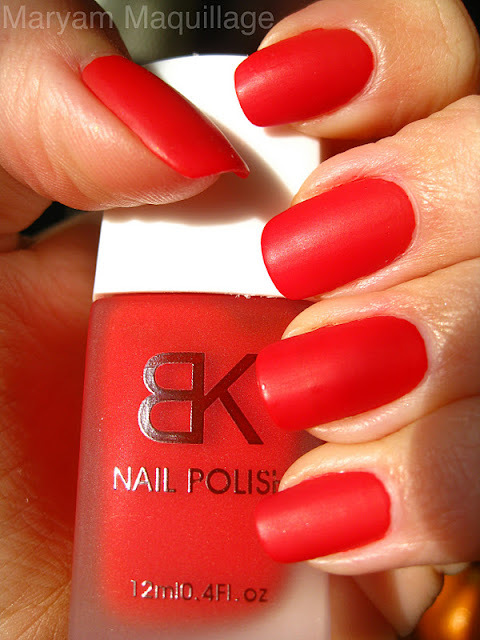 This matte red manicure is gorgeous!! I love it! lovely! i wish i had the patience to do this with my nails!! love it! I am following your blog, hope you have a chance to take a look at mine too! wow I love this!!! Girl you are soo creative you truly truly have a gift and you're amazing!!! OH my!..Gorgeous matte red nail polish..I love it hun..Love your manicure as usual..^_^..Can't wait to see more from you soon.. I've never loved a nail polish shade as much as I love this. And you, of course, for showing it to me. Yes, I love cats also !! Your nails look great! love it! This is a romantic red I'd say! :) Very cute! We love your blog, following! Wow, I love your nails. i am so in love with ur blog! u are gorgeous in EVERYTHING! You are AMAZING with nail stuff!! These are fierce! very pretty i think i will try this :) as soon as i get my hands on those little rhinestones! Wow! Fabulous! I love your creative spirit! You always inspire me so much! Red & Blue - fiery & deadly combination. I already "liked" this on facebook, I want to try it with pink and mint colours!!! This Nailsdesign is amazing! I will try to does this, too:) Thank you for this awesome inspiration! Gorgeous! The sparkly jewels really stand out against the matte polish.